Financial Analysis Templates for Excel are Excel templates designed to be applied to business and financial analysis. This extensive collection contains multiple Excel templates/workbooks for business finance applications and financial analysis. 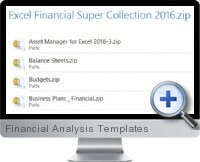 Financial Analysis Templates for Excel help to plan business finances and budgets, analyze and track fixed assets, cash flows and investment projects net present values and internal rate of return. Included in the financial analysis template library are the following Excel templates offered as a comprehensive bundle here at a considerable discount to the combined prices. Links are provided here, where available, to read more about each template or purchase individually. Cash Flow Forecasting - Track monthly cash flows. Financial Ratio Calculation - Monitor company performance. Product Pricing Calculation - Calculate price/demand elasticity. Investment Planning - Net present values and Internal Rate of Return for investment projects. Fixed Asset Accounting - Calculate depreciation and book value balances ahead. Departmental Budgeting - Budget up to 10 divisions or profit centers. Financial Planning - 5 and 10 year financial projection spreadsheets. Business Valuation - Value investments, projects, or companies. Costing Calculation - Assign costs and overheads to products and services. Inventory Management - Product delivery timetables and stock level forecasting. Lease and Loan Calculation - Organize and consolidate up to 100 lease or loan accounts. Quick Statistic Analysis for Business and Investments. Fifty five extra financial functions (VBA) add-in. Upgrade versions for all programs and files. Five years extended download service. Cash Flow Templates provide cash flow reports and forecasts to forecast exact cash positions ahead with quick look up of any daily balance 1-120 days forward using simple listings of payable and receivables. This includes consolidation of five subsidiary offices or divisional daily cash reports into one combined cash flow report. Calculates over forty financial ratios to monitor company performance obtained from two monthly period balance sheet figures, income statements and cash flow templates. Ratios supplied include profit ratios, return on assets, return on equity, economic value added, return on invested capital, working capital ratios, cash flow ratios, operating ratios, asset ratios, inventory ratios, payable and receivable ratios, acid test, quick ratio, debt ratios, solvency ratios, DuPont Ratios, and Core Ratios. The Universal Pricing Excel Templates calculate price - demand elasticities and relationships and uses standard accounting formulas to give the exact price which will produce the maximum profit for any product. The NPV and IRR Excel templates calculate the NPV/ROIC and IRR of business investments, and provide calculators to work out the present value of future receivables or payables and the present value of future cash flows. The Asset Register can be used within any country with S/L depreciation rules. Calculates straight line monthly depreciation and book values by item and by asset category (office supplies, computers, equipment, etc). The Summary report combines depreciation totals , book values, disposals to the current or adjusted month end date. The capacity is up to 10,000 asset records plus 25 asset categories. Depreciation calculations can be switched backwards or forwards in time. The Investment Calculation templates provide over 40 spreadsheets, calculators, tables and business databases that help you apply the time base value of calculating investments returns and present values of future payments and receipts. Templates include project investment analysis modeling, NPV/IRR/ROIC analysis, plus bond amortization and rate of return. Provides linked monthly budgeting for any 12 month period. Starting any date, divisional budgets can be created to report actual and variances, allocate overheads to divisions, set differing cost of sales for each revenue line and generate a year to date budget report. Allows the creation of a 5 year monthly profit and loss, balance sheet and cash flow forecasts by creating simple monthly budgets. Setting up a start date, capital budget and optional share issues enables the automatic calculation of detailed financial plans. These spreadsheet templates calculate the present value of any investment project or company based on cash flows and income forecasts. Revenue and EBITDA valuation benchmarks are provided for 100 business sectors help secure a current valuation based the financial forecasts. Share/equity valuation is included. Valuation can be based on five, ten, fifteen and twenty year forecasting ranges. The Excel costing templates assign individual or average costs to production or services and apply overhead recovery including depreciation to each product or service. The analysis includes benchmarking to other company cost expense ratios. Provides month by month budgets that extrapolate to produce five year monthly income statements, balance sheets and cash flow forecasts, bank balances and shareholder returns. Includes Executive Summary for an overview of key five year financial data with ratios. These templates are ideal for shareholders, investors, banks, business owners, and managers. Organizes product delivery timetables and stock level forecasting schedules. These spreadsheets indicate when to issue purchase order to sustain minimum stock balances. Closing weekly inventory balance forecasts are also calculated. Calculates and combines current period payments of principal and interest, provides outstanding balances, months remaining, payments remaining and asset book values under straight line or declined balance depreciation schedules. Currency Conversion Option - convert analysis at chosen exchange rate (Currency rate updates are provided). Loan Terms and Client Contracts. Monthly and Annual Financial Ratios with Tutorials. Fixed Cost Reduction with Tutorials. Real Estate Valuation and Analysis.